Takeaway: Falls remain to be the number one cause of fatality in the construction industry but effective use of fall protection equipment can ensure worker safety. Climbing a ladder, doing building maintenance, or even just walking on an elevated construction site may lead to a fall (learn more about Fall Protection and Ladders). Falling is a consistent hazard in many industries and it remains the number one cause of fatality in construction, accounting for 39.9% of deaths in 2014, according to data from the Bureau of Labor Statistics. And given that the number of deaths from falls has increased each years since 2011, it's clear that we should be doing more to keep workers safe. Employers are in charge of making sure that the workplace or job site has the strength and structural integrity required to adequately support the weight of the workers. Generally, when construction workers are working six feet or higher above a lower level, employers are required to provide fall protection. Fall protection is a system designed to protect workers who may lose their balance while working at heights, thus preventing hazards and minimizing potential injuries. Fall protection can include guardrails, safety nets, or personal fall arrest systems (find out whether you should use fall arrest or protection at your job site). Fall protection products are usually divided into categories such as fall arrest, positioning, suspension, and retrieval. Ignoring the use of fall protection equipment. Incorrectly using fall protection gear, like wearing harnesses too loosely and using shock-absorbing lanyards in areas with inadequate fall clearance (learn about the relationship between Fall Arrest Force and Clearance). Using equipment beyond their lifespan. Signs of deformity, cuts, and fraying are a good way of identifying whether the equipment has passed its term of service (learn more about the Life Expectancy of Fall Protection Equipment). Lack of instructions in the appropriate language. Waiting for a fall before taking action. Don’t let a fall happen before updating the workplace environment or your organization's fall protection work processes. Maintaining fall protection equipment is crucial in any workplace that uses it. The service life and performance of your system may be the key to saving someone’s life when a hazard arises. Make it a routine to have a competent person visually inspect the equipment before each use. Do not use the equipment if there is any doubt in its safety. Bring your concerns to your supervisor or any competent person who has undergone training about defects and safety issues. If the equipment is defective, replace it immediately. Change any equipment that has been involved in a fall. Have an annual inspection of fall protection equipment from a competent person. Always keep written records of inspections. Always follow the manufacturer’s guidelines about the use and limitations of the product, hazard warnings, fit and adjustment, proper application, and maintenance and care. Either by training or experience, always have a competent person in your workplace to identify, assess, and correct any fall hazards. OSHA defines a “competent person” as "one who is capable of identifying existing and predictable hazards in the surroundings or working conditions which are unsanitary, hazardous, or dangerous to employees, and who has authorization to take prompt corrective measures to eliminate them" (find out how to differentiate hazards from dangers). OSHA’s fall prevention campaign in construction offers three simple steps in fall prevention: Plan. Provide. Train. Plan ahead — When determining how to get a job at heights done, take the time to plan out all the tasks that will be involved and the safety equipment appropriate for each of these tasks. 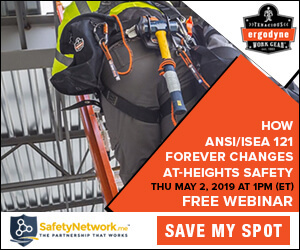 Provide the right equipment — Employers must provide the right kind of equipment, such as ladders, scaffolds, and fall protection equipment, in order to get the job done safely (find out whether you can use scaffold cross bracing instead of guardrails). Train workers on how to use equipment safely — By training workers, employers will equip them with the knowledge needed to identify hazards and properly setting up and using the equipment provided. A comprehensive fall protection program may be handled in different ways but the common goal is always the same: keeping workers safe while getting the job done.